One of Bashar Assad’s best weeks in years – and one of Tayyip Erdogan’s worst – peaked on Friday, Dec. 28. The US exit from NE Syria announced by President Donald Trump on Dec. 19 left an irresistible void for multiple forces to close in, even before a single American soldier was actually lifted off Syrian soil. 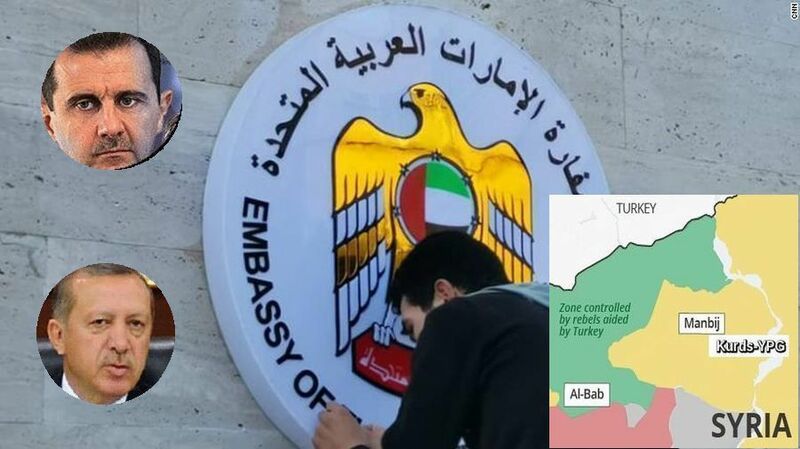 In the wake of that announcement, the UAE cancelled its plans to send troops into northern Syria and instead reopened its embassy in Damascus for the resumption of normal relations, after years of backing the Syrian rebellion against the Assad regime. DEBKAfile’s intelligence sources have learned that Saudi Arabia will shortly follow suit. The two Gulf nations are therefore lining up behind Trump’s new Syrian policy. Encouraged by the hoisting of the UAE flag over its Damascus embassy, Bashar Assad ordered his army on Friday to advance on the northern flashpoint town of Manbij which had been lost to him for most years of the civil war. A Syrian army vanguard has already reached the town’s outskirts, drawing to a halt at its southern entrance. Kurdish YPG militiamen raised the Syrian flag over the town center, after the Kurdish-led, US-backed Syrian Democratic Forces (SDF) and Syrian Arab Army (SAA) reached deal with the Syrian government to ward off the threatened Turkish invasion of this border town. DEBKAfile’s military and intelligence sources can reveal that Russian officers are attached to the command of the Syrian units at the gates of Manbij, This is highly significant because, before accepting the Kurdish request, Assad also sought and received the consent of Russian President Vladimir Putin. In no time, Kremlin spokesperson, Dmitry Peskov, went on record to call Assad’s move a “positive step” that could help stabilize the situation. No surprise there, since the Russians now see their way for the first time to crossing the Euphrates River into northeastern Syria. This move would finally bury the Putin-Obama deal which split Syria between the two powers – Russia in the west and the US east of the Euphrates. The Assad Kurdish deal for the transfer of Manbij to the Syrian government is a stinging setback from Turkish President Erdogan, the second in a month. He was first convinced that he had President Trump’s approval, after the US exit, for his army to move in on Kurdish turf in northeastern Syria, cross the Euphrates and take their capital of Qamishli. Trump did not explicitly dispel this impression. But when a high-ranking US delegation promised to arrive in Ankara and coordinate US-Turkish military moves never turned up, the Turkish leader began to see his plans going up in smoke. He reacted by announcing on Tuesday, Dec. 25 that he was heading to Moscow to discuss with Putin the crisis over the forthcoming US troop pullout and his plan to move the Turkish army across the Euphrates. But then came a slap from the Kremlin. Peskov said that the Russian president’s schedule for the coming days was full. Bereft of support from either Trump or Putin, Erdogan announced that a Turkish delegation of his top officials would travel to Moscow on Saturday, Dec. 29. Led by Defense Minister Gen. Hulusi Akar, Director of MIT intelligence Hakan Fidan and Foreign Minister Mevlut Cavusoglu. The day before the delegation left, the Syrian army reached the outskirts of the key border town of Manbij. In a belated show of muscle, Erdogan ordered Turkey’s Syrian rebel allies – mostly Turkoman militias – to “launch their Manbij offensive.” Moscow is not likely to be impressed. This entry was posted on December 29, 2018 at 12:08 PM and is filed under Uncategorized. You can subscribe via RSS 2.0 feed to this post's comments. You can skip to the end and leave a response. Pinging is currently not allowed.